Since its release, this powerful detector has set the standard for all other detectors. Using the same radar and laser circuitry as the PASSPORT 9500ix, it delivers the best performance for the dollar. Hailed as the benchmark radar/laser detector for your driving needs. The Passport 8500 X50's new "V-Tuned" radar receiver provides extreme detection range on all police radar; conventional and "instant-on" radar, including the new POP mode radar threat, X-Band, and up to 50% more range than the original Passport 8500 on the all-important K and Ka bands. Digital signal processing (DSP) provides maximum range, with minimum false alarms. 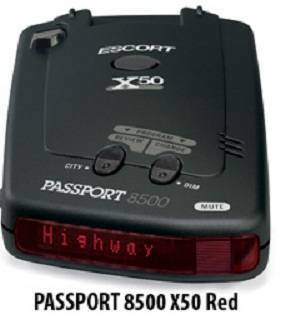 The Passport 8500 X50 includes our proprietary Traffic Sensor Rejection (TSR) software to eliminate false alerts.